Welcome, hoppers! 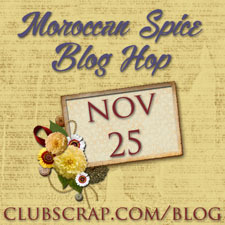 This month we are featuring Club Scrap's November 2015 collection Moroccan Spice, and what a great collection it is! When I received my shipment, I couldn't stop saying, "Wow, wow, wow!" 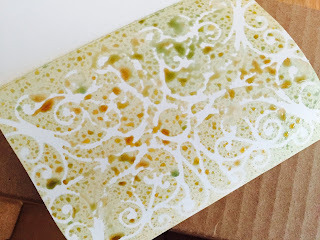 as I discovered all the papers, stamps, fibers, and embellishments in my pizza box. The designers at CS really did a fabulous job when they put together this one! 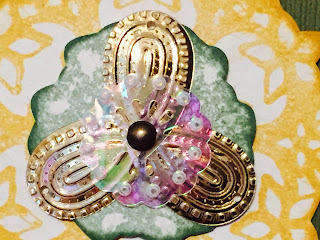 If you are hopping along, you got here from Annette's blog. To get back to the beginning where you will find a list of all the bloggers participating this month, hop on over to the Club Scrap blog. Time got away from me this month, as my husband and I took a 10-day trip to Australia and New Zealand to celebrate our 30th wedding anniversary. (Hoping to get pictures developed and onto scrapbook pages soon!) While we were gone, my husband lost a friend in a car accident, and his wife has been on my heart lately. She came to mind as I was looking through the kit elements for inspiration for this hop project, and I decided to make a sympathy card to send to her. 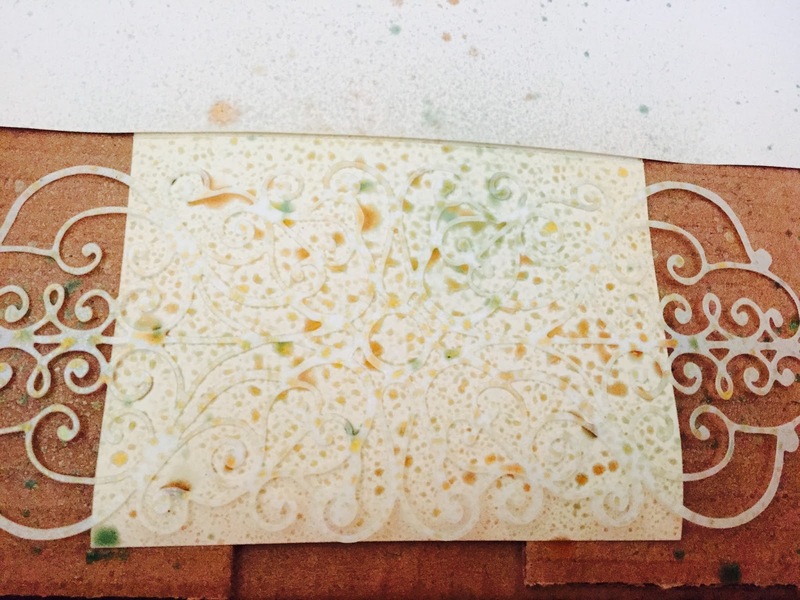 I placed the Moroccan Spice filigree masking stencil on the front of an ivory card and sprayed with the three inks. While the card front was drying, I stamped the large background stamp from the Art Nouveau stamp sheet with Club Scrap's Earth, Moss, and Topaz hybrid inks, extending the stamp a bit so it was long enough for the width of the card. 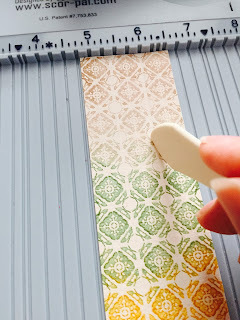 I decided that this stamped strip would wrap over the top of the card, so I scored the piece to make folding easier. From the Borders & Backgrounds stamp sheet, I chose the medallion and stamped it once with Topaz ink and again with Moss. I cut out the center of the Moss image to create a layer. 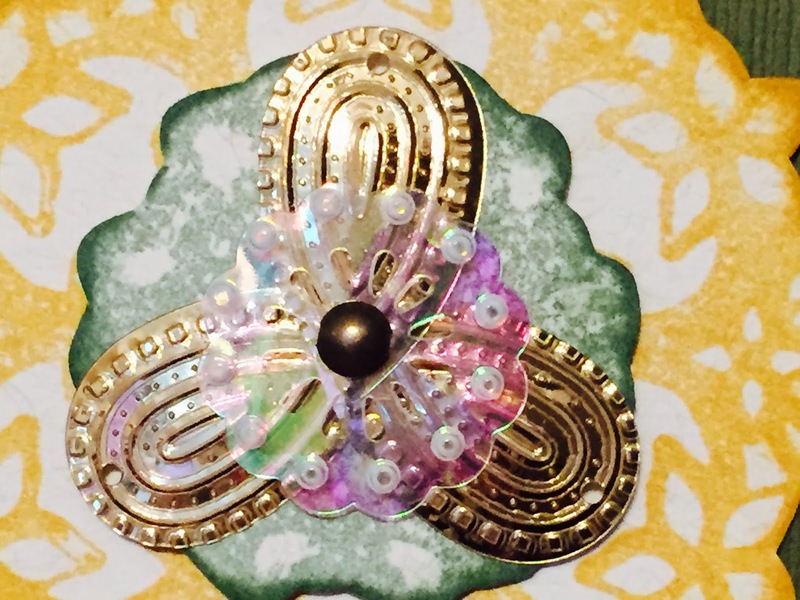 I just love the sequin and brads that were included in the Moroccan Spice embellishment pack. I layered a clear sequin onto three teardrop sequins and attached to the Moss medallion with a brad. 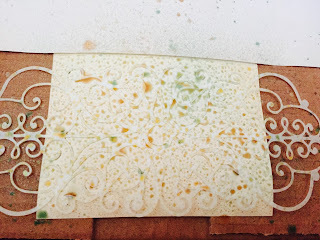 The Topaz and Moss medallions were added to a square of Moroccan Spice Green with the foam adhesive circles that Club Scrap recently started carrying in their store. I love how these circles add just enough depth--so many brands of foam adhesive are too thick for my taste, especially for multiple layers. And that is my project. I hope you enjoyed this stop on the hop. Our next hopper is Jill. 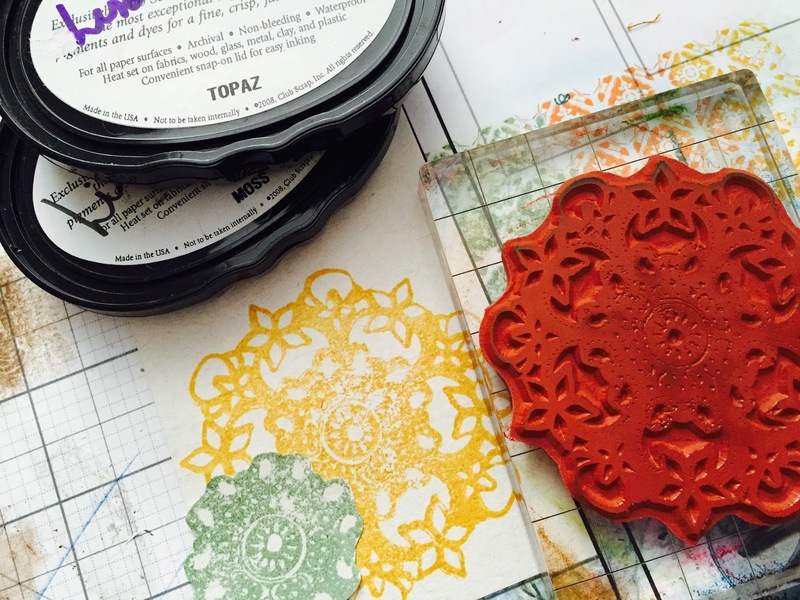 Click HERE to check out what she has created with the Moroccan Spice collection. Beautiful cards, Lisa. 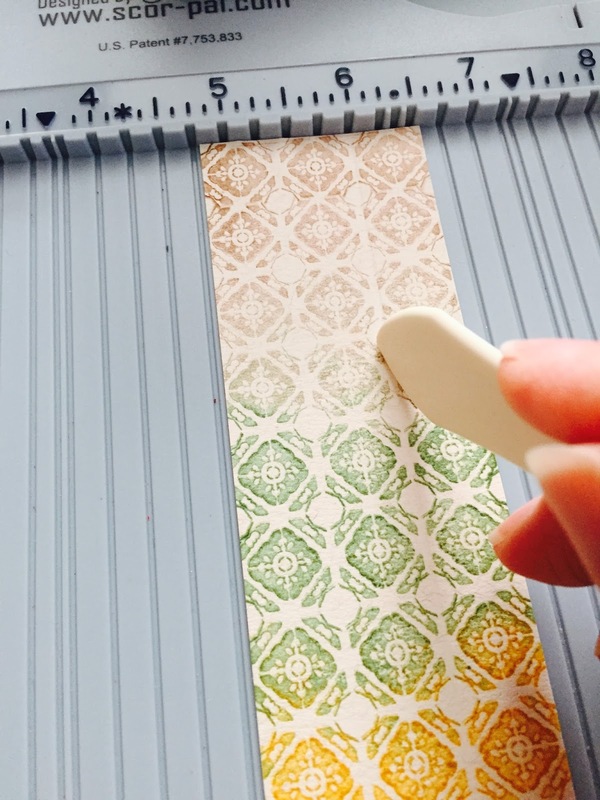 Love spraying and stencils. Such a cool effect. 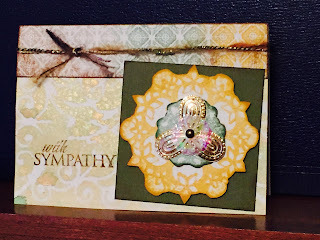 Gorgeous sympathy card Lisa! Have a great day and Happy Thanksgiving! This card is sure to bring comfort and love to your friend. Beautiful work, Lisa! 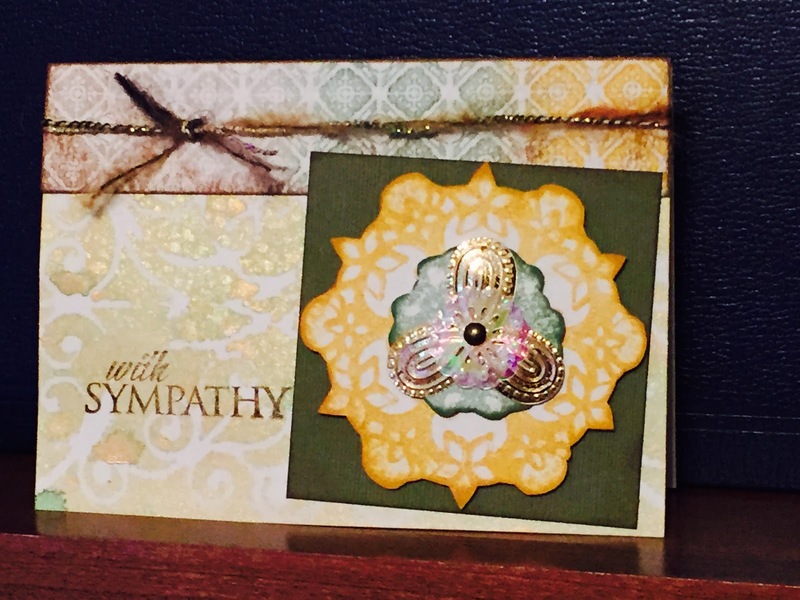 Very beautiful sympathy card. I love the look of sprays too! 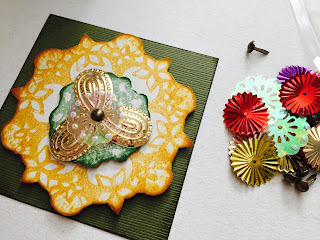 Nice of you to create this for your friend, beautiful card! Beautiful. 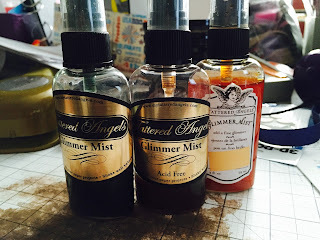 I have never used those sprays, but think I might need to check them out.